Architect professionals RK Next Architects have a real treat in store for us today in the form of a before and after that will truly take your breath away. This home used to be an old-fashioned and unattractive home that went out of style with the dark ages. As we will see, it was in serious need of a breath of fresh air. This is exactly what the designers gave it! The designers have risen to this renovation challenge, creating a modern space that is far beyond ordinary. With a minimalist design and a few quirky and stylish twists, this is a home that certainly turns heads. So let's see just how these designers managed to achieve such a fabulous result! 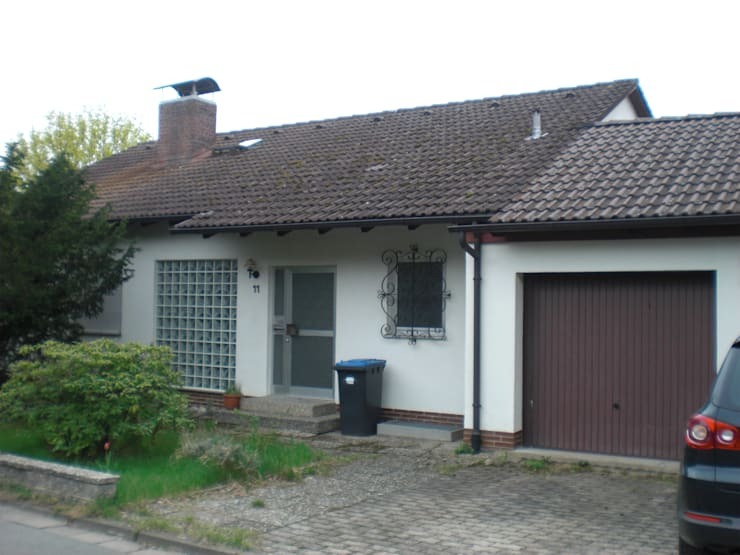 As we can see in this image, before the renovation the home was in a very sad state. It hadn't been looked after or maintained in quite sometime, which means that the roof was old and run down, the driveway paving was cracking with an abundance of weeds and there was a dustbin outside the front door! This is very unappealing. The design of the home itself is very old-fashioned with its 1970's windows, outdated colour palette and granny-like burglar bars. This is a home that you certainly wouldn't stop and stare at! Now this home on the other hand is certainly a home that you would stop and stare at! The designers have replaced the entire home with a modern, minimalist and chic home that anyone would be proud to call home. The designers have gone for a traditional gable roof design, flanked by flat roof structures. 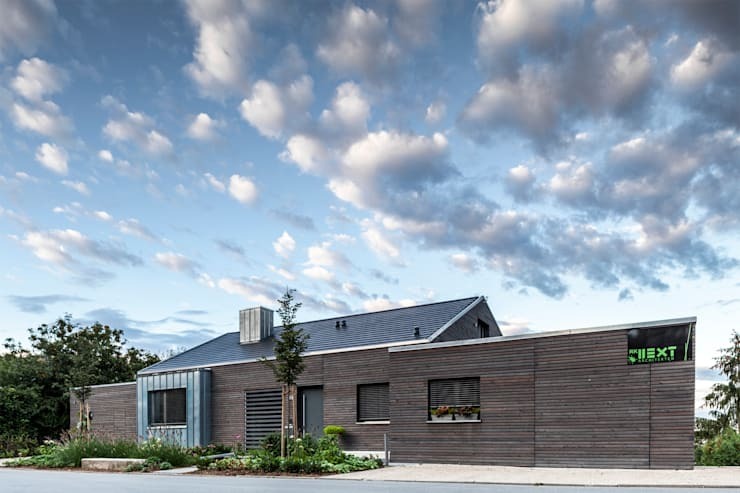 The wooden cladding works in harmony with the grey roof, making for a very warm and earthy design. Don't you love the corrugated iron facade that protrudes from the building, bringing an edgy and industrial touch to the architecture? 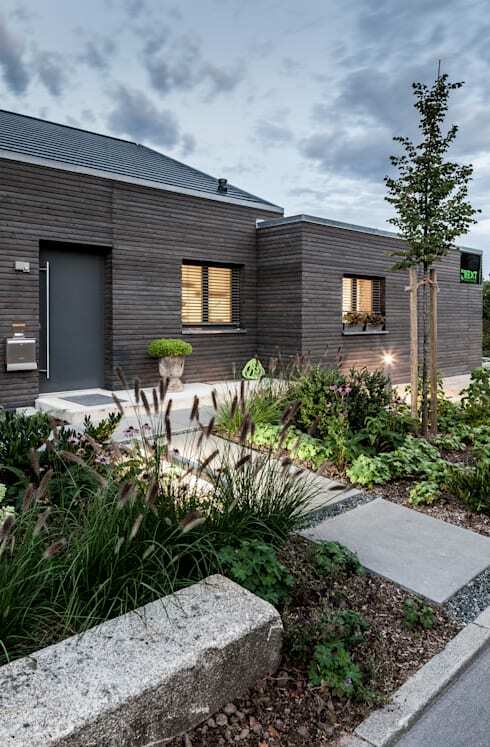 The neutral tones contrast beautifully with the front garden, which has been carefully designed to add a bit of colour and life to the exterior look and feel—a great tip! The entrance to this home is one of its most appealing features. It features a stone pathway, which is positioned in a beautiful and luscious garden. Making your way to the front door will feel like you are walking through a pleasant forest! The entrance itself is situated on a raised step, with a lovely little pot plant next to the black front door. Lighting also illuminates the details of this space, creating ambiance and aesthetic appeal. Outdoor lighting is very important for any family home. It illuminates the exterior spaces, allowing your kids to play on the lawn at night and guests to find their way after sunset. If we go around to the back of the house, we can see that this side of the home is slightly less private than the front. 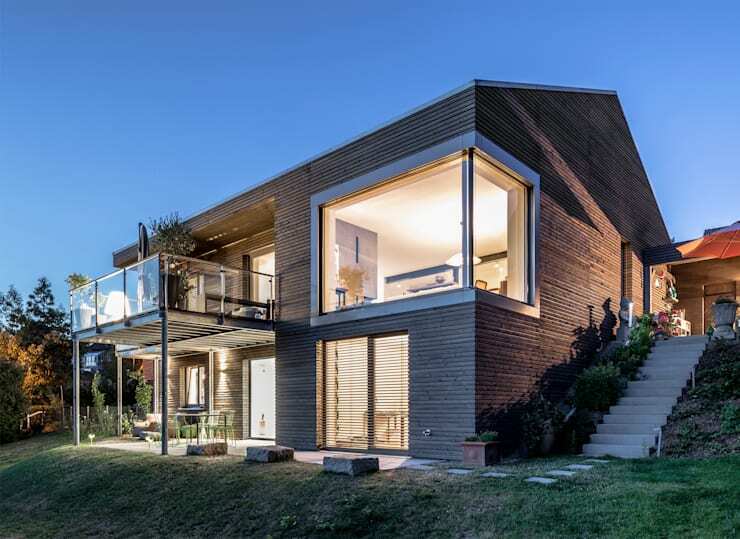 It features large glass windows and doors, which allow the home to spill out onto the exterior spaces. The designers have also invested in outdoor spaces, including a terrace on the bottom floor and a balcony on the first floor. These are outdoor living spaces that the family can enjoy for a multitude of functions under the stars, in the fresh air or in the sunshine. The large glass windows and doors also allow sunshine to flow into the home, opening it up and making it that much more bright, warm and welcoming. If we make our way into the home, we come across quite a unique twist! The living room features neutral tones, including white walls, grey tiled floors and wooden finishes. The dining room furniture is also white. Yet there are also two ottomans covered in artificial turf. This brings in a very refreshing, natural and trendy touch to the space. 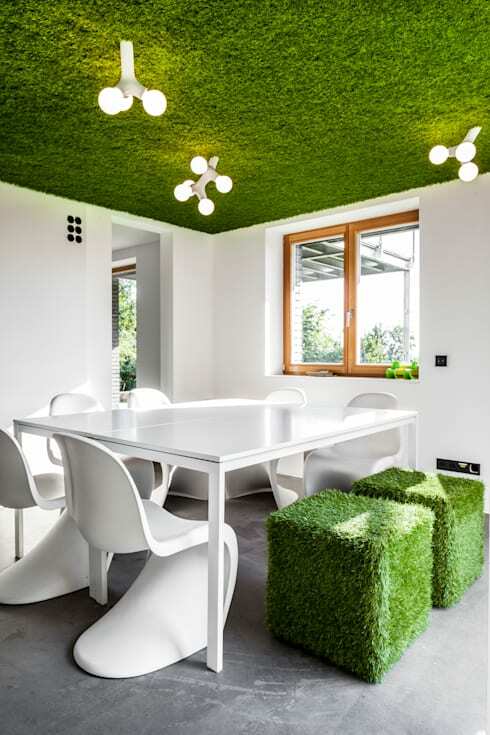 The entire ceiling is also covered in artificial turf! It feels like we are in the fields in this funky living area. Again lighting plays a role here, enhancing the design. 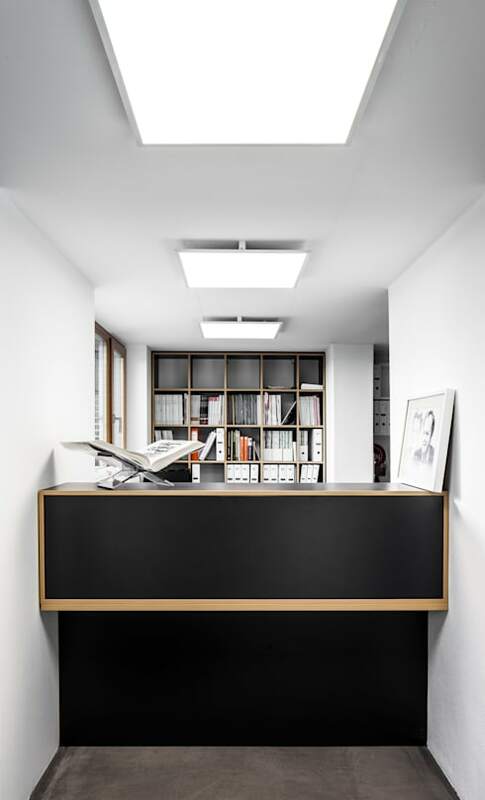 Part of this home may be used for a home office, where one of the rooms has been converted into a reception area that is packed with personality and charm. While there is quite a classic design in the form of a high dark wooden desk and the white walls, there is also artwork, which brings a little bit of that personality and charm into the space. There is also plenty of storage space in this area, thanks to the shelves, which extend along the entire length of the back wall. Here files, books and paperwork can be stored neatly away while still being readily accessible. If you like this ideabook, you'll love this: Before and after: unbelievable home renovation.